It’s not all gloom and doom in the market right now. Johnson & Johnson (NYSE:JNJ) has rallied nicely since the summer. JNJ stock touched a 15-month low in late May — but it’s rallied nicely. Johnson & Johnson stock touched an eight-month high last month before a modest pullback of late. I’d expect JNJ stock to retake those highs. I made the case for the stock back in May, highlighting an attractive valuation, a strong dividend and growth potential in oncology and vision. Even with Johnson & Johnson stock higher, that case remains intact. That’s particularly true after a solid third-quarter report this week, in which J&J handily beat Street estimates on the top and bottom lines. J&J remains a great American company — and the quarter shows it’s performing well at the moment. That combination suggests more upside in Johnson and Johnson stock. Q3 earnings from J&J look strong across the board. Revenue of $20.35 billion rose 3.6% year-over-year, 1.5 points better than consensus estimates. The absolute figure might not sound impressive — but currency knocked almost two points off growth. On an underlying basis — or as J&J calls it, “operational” — revenue rose a solid 5.5%, and 6.1% excluding the effect of acquisitions and divestitures. That’s a very strong performance in the consumer and healthcare spaces at the moment. And it led to solid earnings growth, with adjusted earnings per share rising 7.9%, and 9.5% on an organic basis. A lower tax rate provided some help, but pre-tax earnings grew nicely as well. Johnson and Johnson also raised full-year guidance on both the top and bottom lines. Operational revenue is expected to grow between 5.5% and 6% for the year. Constant-currency EPS growth is guided to 9-10% and, with modest currency help, the reported figure should be nicely higher. Looking closer, the quarter looks solid as well. Revenue from three key oncology drugs combined rose 44%. Pharmaceutical revenue overall rose 9.5% as reported and 13.2% on an organic basis. That’s huge performance in a flat space, and well ahead of recent results from peers like Pfizer (NYSE:PFE) and Merck (NYSE:MRK). U.S. consumer growth of 6.6% is quite impressive in a difficult space, and that segment showed strength across regions and categories. Operational revenue in the profitable contact lens space rose over 6%, as J&J holds off competition from The Cooper Companies (NYSE:COO) and a revitalized Bausch Health (NYSE:BHC) (formerly Valeant Pharmaceuticals). There’s simply a lot of good news here. And, yet, JNJ stock still looks reasonably cheap. Johnson and Johnson stock did rise on the news — but it still trades below the September peak, and 6% below all-time highs reached in January. After a good year, JNJ looks simply too cheap. The midpoint of adjusted EPS guidance suggests a P/E multiple of barely 17. JNJ’s dividend yield, which touched 3% this summer, remains an attractive 2.6%. Both figures look too low. This obviously is a great American company, and one with a 130-year history. Earnings are still growing double-digits. Growth in the pharmaceutical space should continue, driven by the company’s oncology drugs. Consumer brands like Tylenol and Zyrtec are taking market share. And in this kind of market, JNJ stock looks like a safe haven. It’s a classic defensive stock — one that investors typically flock to when volatility rises. After Q3 earnings, I expect they’ll do so. Like all stocks, there are risks here, as Lucas Hahn pointed out earlier this year. J&J is dealing with potential liability from both talcum powder and opioid sales. (J&J did get a big win in a talcum powder case last week, however.) The pharmaceutical space remains pressured, with potential movements on drug pricing from the Trump Administration. And JNJ stock isn’t that inexpensive in the context of peers. PFE and MRK both are cheaper on a forward earnings basis. Consumer stocks generally are trading in the high teens. A 17 multiple might seem about right. But the earnings multiple here can go higher. And continued double-digit EPS growth, plus the dividend, creates a path to ~15% annual gains in the near- to mid-term. That might not sound like the best deal in the market. But for a defensive giant, in this market, it’s quite attractive. And I expect more investors will see that as they digest J&J’s strong Q3 report. 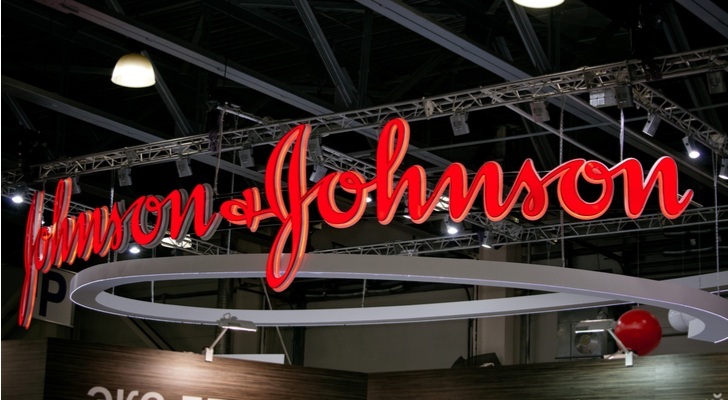 Article printed from InvestorPlace Media, https://investorplace.com/2018/10/strong-earnings-reason-long-jnj-stock/.